On June 24, 1987, a couple of months before she died of cancer, my mother, Joan Joyce (Schiavon) Huesca began writing the story of her life. In the first and second parts of this series, she describes her early years at home. In this excerpt from her book, Joan Joyce Schiavon Huesca: an Autobiography, she fondly recalls her family’s summers at Big Blue Lake, Michigan, and their cottage, Bunny Rest. “Memories are funny, especially as one grows older. They don’t seem to be recalled in sequence of time, so if I sort of “bounce” things about, please understand that one memory many times sparks another. 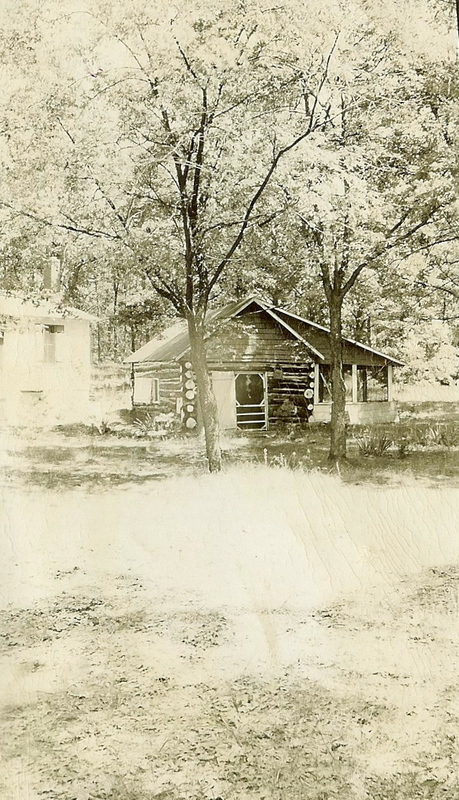 “My Grandfather’s brother, William McGinnis, known to our family as ‘Uncle Bill,’ had retired in his later years to live in a house that he built at Big Blue Lake, about thirty miles north of Muskegon, Michigan. He lived a hermit-like life there, living off the land, trapping mink and other small animals in the winter, and renting boats, selling bottles of water, and whatever else he could to people visiting the lake. (I hesitate to use the term ‘tourists,’ as people in those days were hardly of a present day category of ‘tourists.’) Uncle Bill’s home at that time was quite small. A tiny kitchen, combination living-dining room, a good sized room, used as a closet, stairs to a second floor with one big room, used as a bedroom, a screened-in porch along the front and one side of the house, a wood-burning stove for cooking, and a true-to-name ice box filled with the ice that Uncle Bill would cut from the frozen lake in the winter and store in a tiny cellar beneath the kitchen sink. Outside to the back of the house was the privy. No indoor bathroom here! “My mother was the only one in the family who kept in contact with Uncle Bill, and when she was notified that he had fallen and was hospitalized with a broken hip, she drove the 200 miles from Chicago to where Uncle Bill was interned in a hospital. From what I had been told, Uncle Bill died from his injuries, complicated by pneumonia. He willed his property to my Mother. 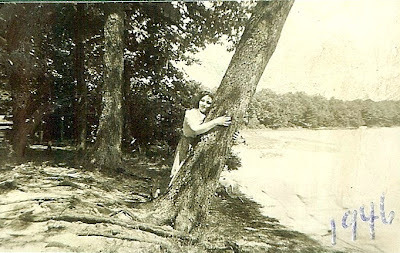 This must have happened in about 1929, as I was just one year old when we first went to the “cottage” to spend a summer there. “Surprisingly, I learned to swim before I could walk. We had the nicest beach on the whole lake, and I would be placed in the shallow water to play, and one day, off I went, swimming! 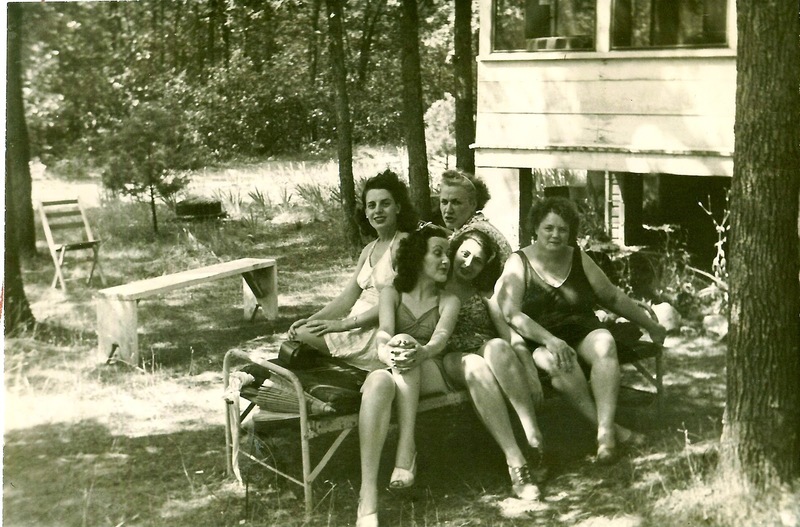 “We spent every summer at the cottage. When school was out, off we would go, packed to the hilt in the reliable Ford of the day, a high vehicle, narrow, and with narrow tires, and a running board along each side. My Mother was the driver in the family. Long before, my Father, who had purchased our first car, tried to drive it home, and found to his amazement that the salesman had forgotten to show him how to stop the car, so he just had to keep driving til he used up all the gasoline. That must have frightened him, for he never really drove a car, so my Mother took over. Schiavon. 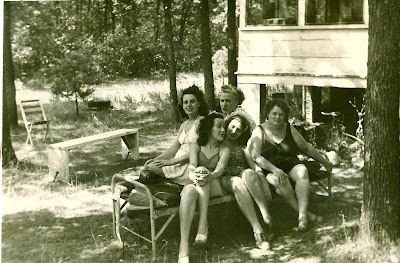 Front row, center: My mother, Joan Schiavon. What a driver she was…FEARLESS! She loved to speed, and would seem to be driving as fast as the car would go. Roads in those days would be unrecognizable today. There were no freeways, but one lane in each direction, unaptly called highways. Fortunately, they were paved. Ten or twelve miles from a little town near the cottage, called Twin Lakes, was a dirt ‘lumber trail’ to travel [as far as] about two blocks from the cottage. (Later, this would become first a gravel road, then finally, a black-topped paved road.) From this point, [another] lumber trail to the cottage (which still exists today). * From Twin Lakes, one would enter a thick, pine forest. The cottage was nestled in the midst of this forest, with sandy ground all about. The lake was just down the way, and we could see its sparkling blue water through the trees. “What a wonderful place for city children such as we! Such a different life, and such wonders to explore! We adjusted to the lack of civilization nicely. My Father would remain in Chicago, working to provide for us. On weekends, he would travel to Muskegon by train (must have been a ‘milk-train’ as it stopped at every little town along the way), usually a trip of eight hours. We looked forward to his arrival, and would leave early in the day to ‘go to town’ to buy groceries and look around the stores. property, not far from Bunny Rest. “On the way, we usually stopped at a wayside cafe where we would feast on barbecue beef sandwiches while my Brother would order a bowl of chili with oyster crackers. Our big treat would be to attend a movie theater, and we would be just in time for the 10:00 p.m. arrival of the train. “I remember, standing outside the depot, watching the train light from afar, and then the engine chugging into the station, excitedly watching for my Daddy who always seemed to be the first person standing on the train platform waving with one hand and grasping a small satchel in the other. I remember running to meet him, and trying to help him carry his bag which always was too heavy for me. 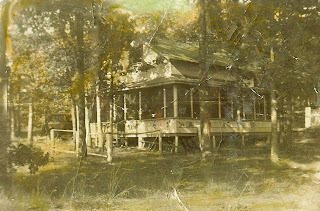 We would all squeeze into the car, and on the long drive home (cars didn’t travel as fast as they do today), I would fall asleep, and be awakened when we would drive alongside of the cottage, then sleepily find my way upstairs after a dish of milk, bread, topped with sugar, for a nightcap. Much of the time, we all shared the big room upstairs, but on mild nights, we children would love to sleep on a cot on the porch. There, we would wake during the night and see families of deer on their way to the lake. Usually, the moonlit nights would be clear and the beauty of the forest would be a breathtaking backdrop for this scene of nature.